I have several wireless mouses. Out of all my wireless mouses, one of them--Logitech M225--stands out, because it is extremely light. But its lightness actually makes the mouse difficult to control with my hand. I know it is the weight, because compared to its brother--Logitech M325--it is one oz lighter (measure on the AWS-100 Digital Scale. I have a gaming mouse and some extra gaming mouse weights. So I took the Logitech M225 mouse apart and put the gaming mouse weights into the hollow cavities. With the weights, the mouse responded more confidently in my hand. Now I understand why gamers balance their gaming mouse with weights. You don't need gaming mouse weights to balance your mouse. In fact, while looking around my home, I found several dead weights that would work. Dead batteries are good candidates as dead weights; they are usually rather weighty. Button cells are small and will fit into small cavities, like the inside of a mouse. I have weighed several different button cells; their weight is comparable to gaming mouse weights. Screw and nuts are great dead weights. Always made out of different metal and plastic, you can use different types to get the exact weight you want. They also come in assorted sizes, great for fitting into different shaped cavities. There are a number of methods to keep the dead weight from shifting around inside the hollow mouse. Plus, you wouldn't want the conductive dead weight to short out electronic circuits. Play-Doh is probably the best and most flexible adhesive. A combination of dead weights mixed in Play-Doh can be shaped to fit just right. The Play-Doh hardens outside its can. 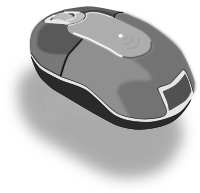 And it's not permanent, so the combination can be removed from the mouse when desired. Tape is easy to come by and can generally keep dead weights in place in small areas. It is also not permanent and can be easily removed. Many times, they will leave a residue, but who cares when it's inside a mouse? White Glue is in almost every home. It's easy to apply and not too messy. If necessary, it can be scrapped off most materials, like plastic.